A call to Bernard Gallay at Bernard Gallay Yacht Brokerage brings confirmation that he's sold his central listing, the 24m sailing yacht Scheherazade to a direct client. Built in 1983 by Palmer Johnson and refitted in 2003, she’s an aluminium centreboard ketch designed by John G. Alden. Scheherazade is a true gentleman’s yacht with a transatlantic range and without overly complex, highly sophisticated equipment on board. 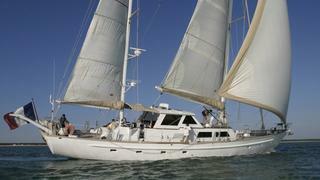 She's equipped with a comfortable deckhouse and sleeps six guests in three double staterooms.